A two hour ride on a freezing marshrutka (small public Ukrainian bus) took us from Lviv to Novovolynsk, the birth place of my man. The marshrutka dropped us in the town in late evening with one other person and drove on to the next small town. The place was completely dead.. not a single person walking the sidewalks and no cars driving the road. We didn't have a map or a phone number, just an address to Yuriy's great aunt's apartment. Luckily the other guy getting off the marshrutka sensed our lack of direction and helped us find the apartment a few blocks down, even taking my suitcase off my hands as we walked. We would have spent all night circling around Novovolynsk with our luggage dragging behind us in the snow if it weren't for this mystery man. We had a hot home-cooked Ukrainian meal, got scolded for dressing so poorly in winter weather, and got to know Yuriy's great aunt, Baba Lyuba, and her son, Vadim during our four day stay in Novovolynsk. Yuriy will write a more personal account for the next post. Novovolynsk is a small mining town that hasn't been around for very long-- it was founded in the 1950s. 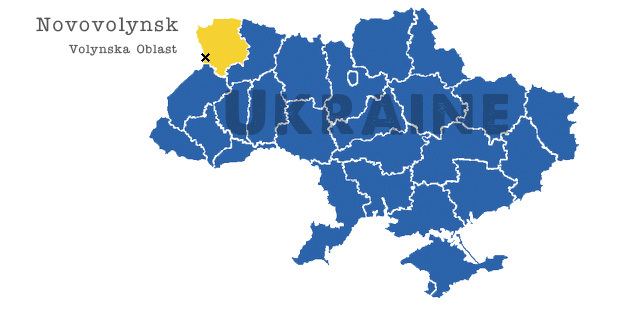 It's part of the Volynska Oblast on the northwestern side of Ukraine, very close to the Polish border. The city has a population of 52,905 (2010, Wikipedia). On our first morning, we bumped into the mystery man from the previous night walking his dog and stopped to chat. That's how small this city is. A twenty minute walk will take you from one end of town to the other. This was the first and only place in all of our travels that we could not find any internet! Most cities have cafes and restaurants with wireless, but not in Novovolynsk. We walked through the entire city center with my iPhone in the air, trying to pick up an internet signal. No luck. We found out later that there is a "business center" in town where we could pay for internet. Excited, we packed our laptops and headed over after dinner on our last day, only to find that it had closed at 6pm. It was actually a very nice and comforting feeling to be in a small Ukrainian town with no connection to the outside world, no agenda, no sightseeing to speak of (not much of a tourist destination), listening to old stories of family history every day and getting well fed. Baba Lyuba believes if you eat a big meal, you won't be so cold in the snow. We definitely took her advice. Both the 16th and 20th picture down remind me so much of the painting "Easter Morning" by Caspar David Friedrich. Beautiful! Amazing photographs, as usual. I would love to visit somewhere like this. It's nice to venture out of the tourist places and of course great for Yuriy to re-visit as an adult. I love the photo of all the threes looking down the street. It's great to disconnect from the world sometimes and just be. Glad you two were able to have such a kind man to direct you to Baba Lyuba's apartment. Just about every Eastern European I know has a Baba Lyuba in their family. this is probably my new favorite post. perhaps it is the simplicity of small town life or the quietness of all the photos. Rou- So true! I just googled it. Serge- Not that I recall. Though we may have walked it and not known it. Why is it famous? Inessa- Seriously! So funny. Slavic names are so stinking common. Kae- Really?! Yuriy will be so proud as a native of this town. I just love your blog, by the way and you both seem to be amazing people- outside and inside! Your photos are so inspiring. Every single one! I like the idea of the more food you eat, the warmer you'll be outside. Makes me cold just looking at the photos. For how long do they have snow out of the year?